It was with huge excitement and a hint of trepidation that I ventured to the Civic in the centre of Auckland town last week. 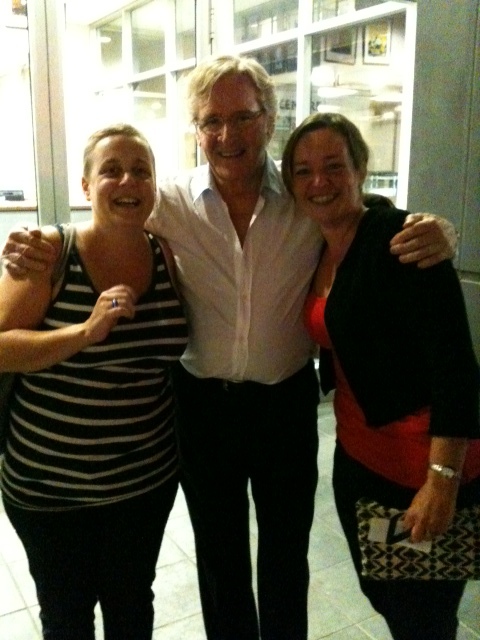 My fellow blogger, Angela, had very kindly treated me and her elder daughter, Kate, to a night out at the theatre. One never knows quite what to expect when Angela says, ‘I’ve got a surprise for you’, but in this instance you can forget Shakespeare, Chekhov or Ibsen, we were off to see Coronation Street on Stage (don’t forget the exclamation mark)! Starring none other than William ‘Ken Barlow’ Roache. GET IN! Upon arrival, we headed straight to the bar for an over-priced glass of Dutch courage. Kate and I were delighted to see that we were the youngest people in attendance. The purple rinse brigade were out in force, as we pushed by the Zimmer frames to take our (practically front row) seats. The intro. music began: ‘de, der, der, der, der’ and I was half expecting that moggy from the opening credits to zoom across the stage. And then he appeared. Ken Barlow. Then I did something totally out of character which would have made my mother die of embarrassment. I cheered and ‘woooood’ like a demented tweenie at a One Direction concert. I stopped short of throwing my knickers, but only because it would have taken me half an hour to undress and Ken would have been unable to play his part of narrator from beneath my marquee pants. It took me a while to realise why I was in seventh heaven watching the show, and then I realised: it’s because I grew up watching the TV programme and have always absolutely loved it. Coronation Street is without doubt the best written soap opera ever. With its mixture of pathos, comedy, grittiness, great writing and excellent character performances, it makes Eastenders look like a never-ending bad school play. It has always had great strong matriarchal figures, a sense of morality and above all, an ability to make its audience laugh and cry. I have often wondered how strange it would be to spend your life acting in a soap opera. I have imagined Eileen Derbyshire (the actress who plays Emily Bishop), lying on her death bed and saying; ‘Well was that it? 50 years on Coro. No big storylines (apart from when I went loopy), no snogging (poor Ernest was killed off in 1978), all those years of looking after Tracey for Deidre and she paid me back by murdering her boyfriend. I never even got to bed the street’s lothario, William ‘Ken Barlow’ Roache.’ I was reminded of this again as I wondered why William Roache at the age of 80, was standing on a stage, on a Wednesday night in Auckland, playing to a three quarters empty house. I found the answer to this as Kate and I waited at the stage door at the end of the show. As the other cast members left the building with Kate (in her best stage whisper) shouting, ‘was she in it?’; out came Ken. Dressed as Ken, looking and sounding like Ken. I threw myself at him and gave him a big kiss – thank God my 7 year old daughter wasn’t there ‘shame Mum’ – he cuddled Kate and me and posed happily for photos, asking if we had enjoyed the show. I was smitten. What a charming man. If he had asked us back to his hotel for half a bitter, I swear we’d have said yes without a moment’s hesitation. He has been doing this for 50 years, and he clearly loves the adoration. Apparently his own father once called him Ken. It begs the question, where does Ken end and William start? Does he know? Does he care? After recent inappropriate remarks about the victims of paedophiles it’s almost comforting to know that William Roache is as flawed as his alter-ego. So thank you Angela for treating me to a superb evening and my cohort Kate who giggled along with me. And thank you William Roache for your graciousness when faced with yet another mad middle-aged, large knicker-wearing fan. But most importantly thank you Coronation Street, here’s to the next 50 years!